Handymen, professional mechanics, technicians, journeymen, DIYers, and welders have one thing in common. These experts need a way to transport tools and supplies from one job to the next, and such a method should help them organize the tools and make them easily accessible. In short, these experts need a toolbox. Having in mind however that such toolboxes have been in use for centuries and that each period comes with new sets of toolkits, picking the right tool chest or cabinet can be quite confusing. So, how do you locate the right tool cabinet? You can do exactly that by having a look at this compressive review. It comprises of 13 best machinist tool chests selected in terms of durability, security, sufficient room for organization, among others. Are you in need of a portable storage option that is designed to keep small tools organized? Or, are you in search of a toolbox that is designed to store and organize small parts and pieces? Either way, the Trinity wood toolbox can help you keep everything separated and within reach. The toolbox measures 20.75” W x 10.5” D x 13.75” H and weighs 23.6pounds. It includes eight fully removable drawers to enhance easy access of the stored items. Besides that, there is a felt-lined interior designed to offer extra protection for the stored items. The front cover is another addition that folds down and stows away underneath the drawers when opened so that you can place the toolbox in any room with an assurance that it will remain neat and stylish. 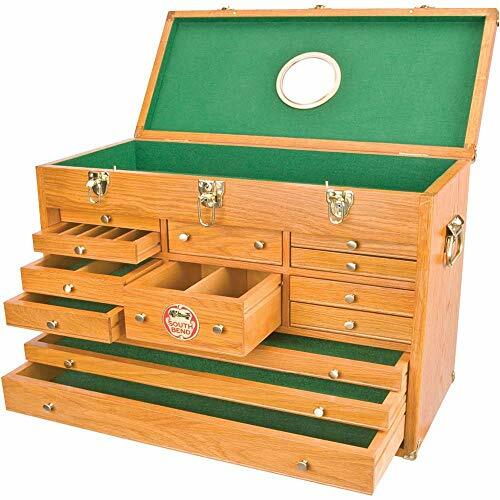 The toolbox is finished with a rich mahogany color to enhance a stylish look. Further, it features nickel-plated hardware, handles, and corners making it a great addition in modern decors. You can place the toolbox on any surface without having to worry that it will cause damage due to the included silicone feet that don’t scratch surfaces. Besides using the toolbox to store tools, you can use it as a jewelry box, storage for small parts, or a box for storing crafting and art supplies. 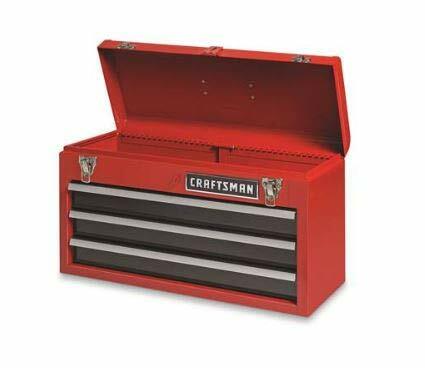 An easy way to maintain an organized workshop lies on acquiring the Craftsman 3-drawer toolbox. The box features cover hinges designed to maintain an open lid so that you can access the tools easily. Also, it features a comfortable top handle designed to enhance easy carrying so that you can take the tools wherever you want. Craftsman 3-Drawer toolbox is a great option to a machinist toolbox that is designed to enhance safety due to the heavy-duty draw bolt latches that maintain a closed lid. On top of that, the toolbox includes a hasp and staple feature designed for use with padlocks to enhance security. The toolbox includes drawers that lock automatically once the lid is closed to enhance convenience. Further, the drawers slide open and close under heavy loads to enhance convenience. The machinist toolbox is made using heavy-duty materials which means that you can get it when you are on need of a toolbox that is designed to last. 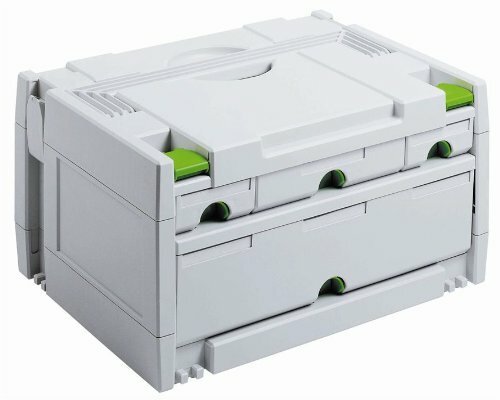 A perfect way to store small items, tools, and hobby supplies that need to be organized is the Festool 4-drawer Sortainer. The unit features four drawers that are accessible from both sides to enhance reliability. Its drawers are of different sizes, and each features a latch so that you can get the unit with an assurance that none of the drawers will fall off accidentally. You can get this unit as the answer to a machinist toolbox that is easy to customize, thanks to the insert dividers that allows you to configure the compartments and the drawers. Also, the toolbox is a great choice for one that offers a portable solution for all supplies. The reason is that you can remove individual drawers from the Sortainer so that you take what you need without having to carry along the entire toolbox. Keep everything in its place once you acquire the Grizzly 3-drawer middle chest. As the name suggests, the chest features three drawers two of the same size and another that is slightly bigger than the two. More to that, the chest features a Grizzly green powder coated finish which is not only stylish but enables it to fit a variety of decors. You can expect this chest to last for long, thanks to the heavy-duty side handles. Furthermore, the chest features three protective drawer liners designed to protect the tools from scratching once you keep them to storage. The middle chest comes with a lock and keys to guarantee the safety of the stored items. It weighs 36lbs which means that you can carry it wherever you want without worrying about portability. From South Bend, we have the SB1251 machinist oak chest. 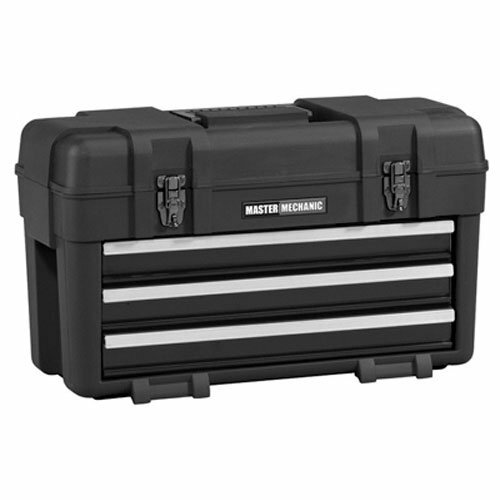 The toolbox features an overall size of 26″W x 12″ D x 18-3/8″H. It includes 13 drawers of different sizes, a top locking lid, and a front panel. The front panel helps to secure the drawers once you lock them, and slides neatly under the bottom drawer once you access the drawers. You can expect the toolbox to deliver years of dependable service thanks to the fact that it features a solid mortise with Tenon joinery construction. Furthermore, the toolkit can protect your tools from damage since all drawers, and the top compartment are felt-lined to protect the tools from getting scratched. Seven of the drawers include removable dividers to enhance a better organization of the tools. On the other hand, the hardware features a brass material which assures you of durability and a stylish look. 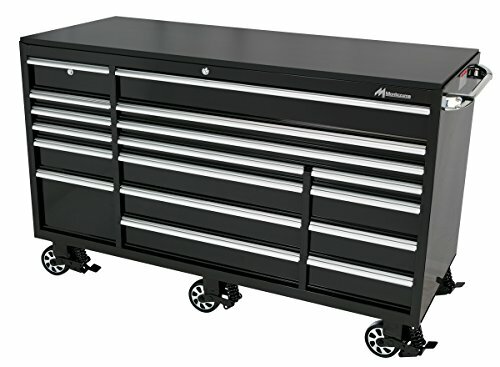 Forged using industrial-strength materials, the Kennedy Manufacturing Machinist’s Tool storage chest is one of the best toolboxes for users looking for a toolbox that is designed to last. In particular, the toolbox is made using steel to guarantee durability. Besides that, it features wool-lined drawers so that you can be sure to keep your tools protected at all times. The storage chest includes a tubular lock designed to keep contents safe. Further, there is a front drop panel that is designed to conceal the drawers and keep them safe from elements so that you can get the toolbox with a guarantee of lasting performance. The storage chest is compatible with a variety of cabinets among these Kennedy 526 & 52611 machinist chests and Kennedy 295, 297, & 348 roller cabinets. Next, we have the Waterloo plastic portable chest. The chest acts as an excellent portable storage solution for project components, hardware, and tools that need to be organized since it comes with three drawers. The drawers are made using stainless steel to enhance durability. Also, there are full extension slides that lock once the lid is closed to enhance versatility. 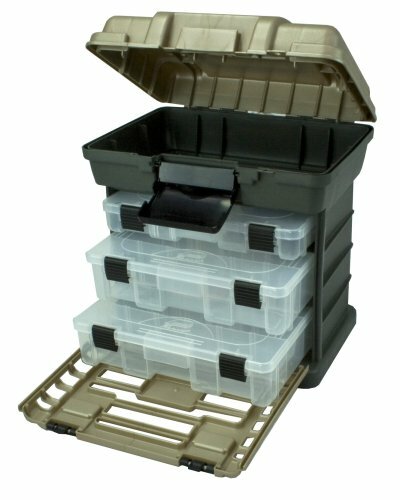 You can get the storage chest when you are looking for a toolbox that is designed to last since it is molded using heavy-duty high-impact polypropylene resins. More to that, the tool chest is a great choice for one that is easy to carry due to the sure-grip handle that guarantees a secure grip of the portable chest. The chest includes storage pockets located in the cover enabling it to hold small parts when you are working on projects. Additionally, it includes a generous top storage area designed to offer additional storage space. The heavy-duty rust-resistant latches are another plus of the portable tool chest so that you can get it with an assurance of getting a tool box that will protect your tools from interference. Safeguard your tools for years with Thor Kitchen’s machinist toolbox. The toolbox features stainless steel as the primary material which makes it a perfect toolkit for users looking for a unit that is designed to deliver years of dependable service. Adding to that, it features a rubberwood on the top. As a result, you can use the top as a work surface with safety assurance. The tool chest measures 72″L x 18″W x 37.5″H. It consists of 15 drawers which mean that you can use it to organize different tools. In it, you can store products that weigh up to 100pounds whereas the tool chest weighs 326lbs. The chest includes side push handles which make it easy to move as you roll on different surfaces. Its heavy-duty casters are another plus which makes it easy to haul from one surface to another. Since the stainless steel material is anti-fingerprint, you can be sure to have an easy time when cleaning it. An ideal storage solution for use in garages, offices, homes, workplaces, or anywhere else where tool organization is needed is the Goplus 6-drawer storage cabinet. The cabinet is made using high-quality cold rolled steel to guarantee strength. Further, it is painted using glossy anti-rust and corrosion-resistant paint. Because of this, the storage cabinet is easy to clean and designed for long-lasting performance. You can use the cabinet to store a variety of items, thanks to the fact that it comes with four small drawers, two trays, two large drawers, and a big bottom cabinet. Besides that, the cabinet features a detachable design where the whole cabinet is separable to two boxes. This means that you can opt to use the boxes separately or together so that you can meet your needs. Another plus of the cabinet is the top chest drawer that is secured by a keyed external locking system. This means that you can use it to store items that need to be stored securely with an assurance of safety. Besides that, the cabinet includes four swivel casters of which two include brakes so that you can move the cabinet with ease and even brake the wheels to keep it in place. The four hooks on the cabinet are another addition designed to let you hang small items and wrenches. Also, there is a handle on the side of the cabinet designed to enhance convenient control of the unit. You can store your items in the cabinet drawers with an assurance of safety since each cabinet includes EVA pads designed to protect the tools from scratches. Whether you are buying a toolbox for a plumber, electrician, or DIY enthusiast, you can be sure to make the right choice when you decide to purchase this machinist toolbox. Featuring a sturdy polypropylene resin construction, the Keter New Portable toolbox serves as a perfect choice when you are looking for a toolbox that is designed to last. 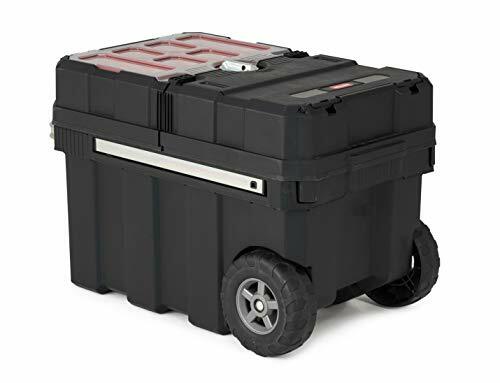 Besides that, the tool chest is a great choice for one that is easy to carry due to the 7” rubber wheels and the extendable handle that offers a comfortable experience when rolling. The toolbox includes a central locking mechanism so that you can store your tools with an assurance of security. Further, it features a tool divider that makes easy to organize the tools. You can slide the topmost bins of the toolbox so that it can reveal the main tray for storage of the tools that are used often. The less-frequently used tools can be stored below which guarantees you of an easy organization. On the eleventh spot is Plano Molding Stow N Go toolbox. the toolkit serves as an ideal solution for carrying and storing tools and crafts items. Among the features that make the chest effective at this is its three partitioned utility StowAway trays. The trays are then concealed by a fold-down grate to enhance stylish storage. You can get the toolbox as an answer to a tool chest that will render years of reliable service, thanks to the impact-resistant quality craftsmanship. Furthermore, the toolbox is a perfect choice for securing items since it comes while equipped with tension-lock latches. The tool chest measures 14″ x 10″ x 13.375″. It includes a molded handle which makes it easy to take from one place to the next. Do you want a toolbox that will help you keep different tools separated and within easy reach? Well, this is the tool chest to buy. The chest includes six ball-bearing slide drawers so that you can organize your tools. Further, it features a top tray storage compartment which means more room for organization. The toolbox measures 26″L x 12.7″W x 15″H. It features a steel construction which means that it is the answer to a durably-constructed tool chest. Its 6″ heavy-duty welded lifting handles are another plus so that you can get it with an assurance of easy lifting. Once you opt to get it, you can be sure to have invested a toolbox that will serve you for years due to the powder-coat paint that offers superior chemical resistance and scratch resistance. Further, the tool chest is a great pick for one that is designed to store your accessories safely since it includes a lock that comes with two keys. The answer to a functional and stylish toolbox designed for use in any home environment is Montezuma Tool Box. 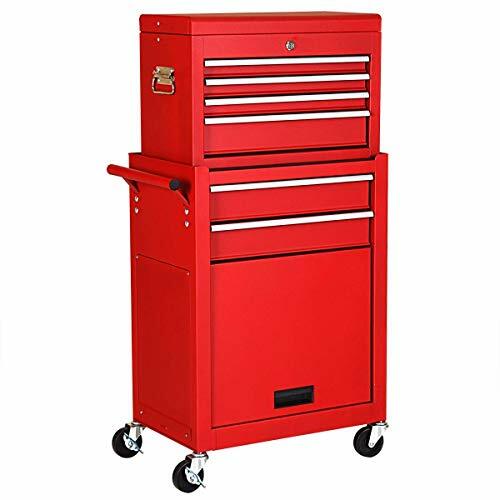 Whether you are a machinist, small engine technician, automotive mechanic, or welder, you can get this toolbox with an assurance of getting perfect storage for different tools. Equipped with 17 ballbearing drawers that slide in and out with a lot of ease, the toolbox can store different tools with an assurance of easy access. Another plus is that the drawer includes premium drawer liners. The liners provide sufficient protection which means that you can store tools with an assurance that they won’t get damaged. Montezuma Tool Box comes equipped with two rigid casters and four swiveling casters to guarantee portability. Also, there are raise-and-release handles that snap on to the drawers after closing to avoid unwanted opening. The toolbox measures 74.8″ x 50.5″ x 32″ while it weighs 1,128 pounds. It supports a 250lbs capacity which makes it perfect for storing a range of tools. The chest is made using 18-gauge steel to guarantee strength. It further features a durable PVC-coated MDF benchtop work surface designed to guarantee durability. What should I consider when shopping a toolbox? Some of you might argue the cost is the most crucial factor, but remember that there is more to that. With this in mind, I would recommend that you start with considering the space. In this case, look for a tool chest that includes enough space so that you can store or the essential and organize them. Next, get a toolbox that features a durable construction preferably steel. That not all since you will need the toolbox to have smooth sliding drawers. As a result, get a unit that features ball bearing for smooth sliding. Based on whether you want to carry your toolbox wherever you go, you can consider the weight of the cabinet. However, getting a tool chest that features smooth-rolling casters and a strong molded handle is the perfect way to go. What are the different types of machinist toolboxes? Machinist toolboxes come in three different types; a tool chest, a tool cabinet, and a mobile workbench. A tool cabinet is a heavy-duty toolbox that provides plenty of storage room so that you can use it to store a range of tools. Unlike the other two types, a cabinet is bigger and with more weight which means that it isn’t the best choice for a portable toolbox. As a result, tool cabinets are appropriate options for use in a stationary location. A tool chest is a perfect choice for a user looking for a portable storage solution. Tool chests can be placed on top of a tool cabinet or beneath a workbench so that you can maximize the storage space. Unlike a tool cabinet, tool chests do not offer big drawers which makes them suitable for use when storing small-sized tools. Mobile workbenches are quite similar to tool cabinets. However, the units are lighter and thereby easy to maneuver around. The units feature a finished top surface which means that you can pull out a stool cross by so that you can work from there. Are tool chests a perfect choice for users in need of storage that will keep tools organized? Yes. Whether you want to organize big tools such as power tools or small ones such as screws, you can rely on a tool chest. The reason is that tool chest come while equipped with several drawers all featuring different sizes. As a result, you can be sure to find deeper drawers for bigger tools and slimmer drawers for smaller items. I need a portable machinist toolbox. What features should I be on the lookout for? If you want to get a toolbox that is easy to maneuver, get one that features a bearable weight. 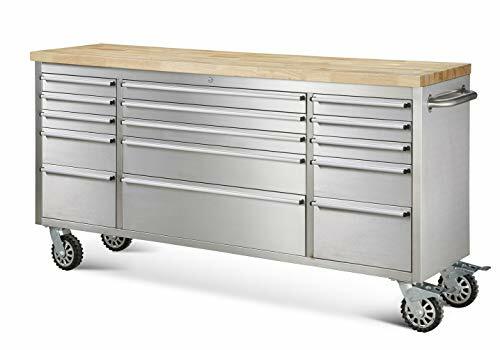 Asides from that, a toolbox that includes casters and a built-in handle will serve you better since these features allow the user to haul the toolbox from one position to the next easily. I hope, this article can help you keep your garage neat and organized while enabling you to have easy access to the tools you use often. For this reason, I would recommend that you get the model that makes you happy since these are designed to help you benefit from years of reliable performance without breaking the bank.